(Phys.org) —It was an interesting week for physics—an international team of researchers openly questioned whether the particle discovered last year was truly the Higgs boson, since as they note, there is no conclusive evidence that it really was. 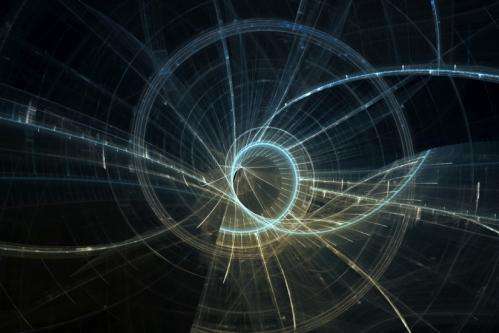 Also, two physicists with USC suggested that maybe string field theory could be the foundation of quantum mechanics—providing a basis for all of physics and perhaps answering the question of where quantum mechanics actually comes from. And another team of physicists proposed the identification of a gravitational arrow of time—they've taken time out of mathematical equations used to describe the total energy of the universe allowing them to split equations that describe the evolution of the universe into two parts. In other news, researchers working to solve the problem of growing resistance to antibacterial agents have found a possible alternative to antibiotics—artificial nanoparticles made of lipids that serve as decoys, attracting harmful bacteria and preventing them from attacking their actual target. Equally pressing is a better understanding of what is happening to our world as global warming continues unabated. Researchers at Berkeley identified a new driver behind Arctic warming—turns out the open ocean is far less efficient at emitting in the far-red spectrum than is ice, which means the Arctic Ocean traps more heat than has been thought. In news from space, a team of astronomers believe they have solved the mystery of the bizarre object at the center of our galaxy—they think it's a pair of binary stars. Meanwhile NASA's Curiosity rover found a mineral match—showing that measurements taken from a distance match those of real minerals found on Mars. There was big news in biology as well, as a drug being tested in a clinical trial was shown to completely reverse diabetes in human islets and mice. More research will have to be done, of course, but thus far, the researchers report that the drug looks promising. And finally, for those who have been wondering, researchers have found that those who adhere to the Mediterranean diet are likely to see lasting health benefits—they found that the diet led to improved blood flow to cells lining blood vessels, for up to a year after the diet was stopped—an indicator of overall general good health. That a mathematically predicted quantum energy threshold was achieved at CERN and which yielded the expected results - that of the release of a massive precursor particle with a lifetime of a hundred billionths of a billionth of a second and which yielded subsequent generation particles - was in NO WAY QUESTIONED. Peter Higgs may have been premature in suggesting, before this achievement, that the predicted particle might be that which confers mass upon all the other particles, because that has not been proved, and this is in question. A particle that confers mass upon the other particles? I think not. That particle doesn't exist, IMO.